1) Internet is used by Millions over People Daily in Pakistan. 2) Average Growth Rate is 70% for the Next Four Years. 5) Web Marketing Operate 24 hours a Day, 365 days a Year. 6) When Creating New Promotion, Web Marketing have Control over Positioning. 10) Secure Online Order System. 11) Gives detailed Information on No. of Visitors that visit the Web Ad. 12) Small and Mid Size Business that have Invested in E-Marketing will benefit most. 11) Will help Translate Greater Products Sales as a Result of Increased Customer Knowledge. There's an old quote that goes: "If you're going to do something, do it right or not at all." You want to do right by your customers, and that means giving them something worth every penny they paid for it and then some. How can Findpk accelerate your business? 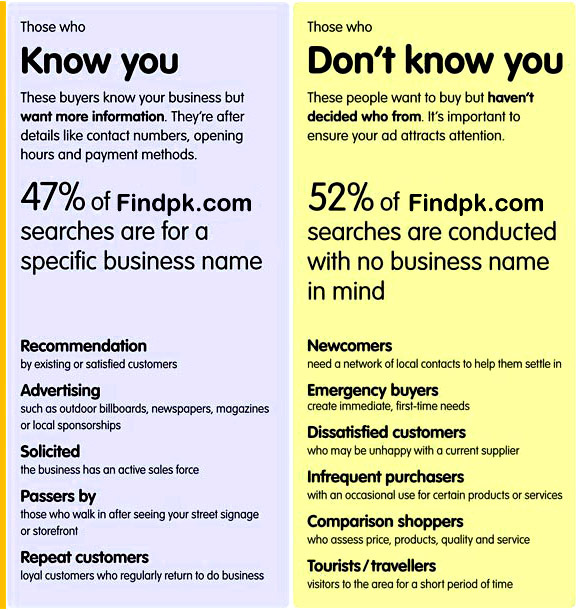 People from all over the world turn to findpk.com Yellow Pages as their One Stop Destination and Premier Online Source for information on Pakistan in 14 International Languages such as English, French, Spanish, German, Italian, Portuguese, Japanese, Korean, Dutch, Greek, Russian, Chinese Simple and Chinese Traditional.